For the first time in franchise history, the Winnipeg Jets won game on in their Stanley Cup playoff series against the Minnesota Wild. Although it wasn't as entertaining as the 7-0 the Pittsburgh Penguins handed their intra-city rivals, the Philadelphia Flyers, or the electric atmosphere of a live pre-game hype video for the series between the Vegas Golden Knights and the LA Kings, it sure was a great game. And the fans of the home team have something to cheer about for the first time in franchise history. In Game 1 of the Winnipeg Jets and Minnesota Wild series, the Jets walked away with a 3-2 win over their Western Conference opponents. The game took some time getting used to, with the Jets getting a taste of what playoff hockey feels like. The game was scoreless after the first 20 minutes of play. But at 17:37 of the second period, the Jets open the scoring with a Mark Scheifele goal to give Winnipeg the 1-0 lead. In the third and final period, Minnesota clawed their way back with two goals of their own. Minnesota doubled their lead two minutes later when Zach Parise gave the Wild their first lead of the night. After Mikko Koivu got hit at the blue line, a 2-on-1 attack busted out the other way, resulting in the goal. The Jets didn't give up the fight. Not only did the team make history, but Patrick Laine also made club history by being the youngest goalscorer in franchise history to score in the playoffs. His goal was good enough to tie the game at 4:51 in the last frame. With less than 10 minutes before the possible overtime period, more life struck the Jets as they scored the go-ahead goal at 12:47, courtesy of Joe Morrow who scored his first NHL playoff goal. "That's the majority of the reason you play hockey as a kid is to come and play in the playoffs, play for the Stanley Cup and getting an opportunity to score a goal like that," Morrow said. "So, to say it's a dream come true is a pretty big understatement." 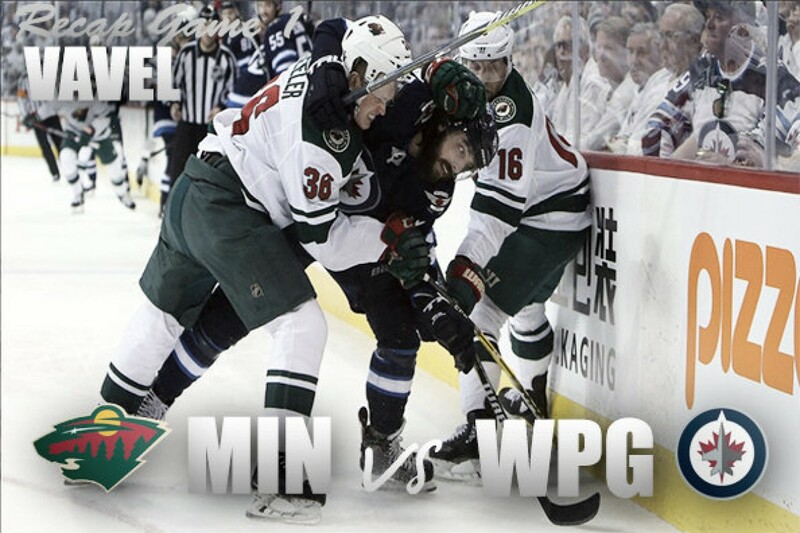 Minnesota pulled goaltender Devan Dubnyk with 2:30 remaining in the period. Winnipeg tried multiple times to ice the cake, but couldn't convert. Jets' goalie Connor Hellebuyck made 18 saves for his first NHL playoff win. Seems there were quite a few 'firsts' in this playoff game. The Jets not only outplayed but also outshot the Wild 40-20 to end the game. Everything went right for the home team. Minimal powerplay success (1-2 PP), a netminder who stood on his head and kept his team in the fight, and a raging crowd behind you to lift you to victory. Congratulations Winnipeg. Here's to many more in the future!